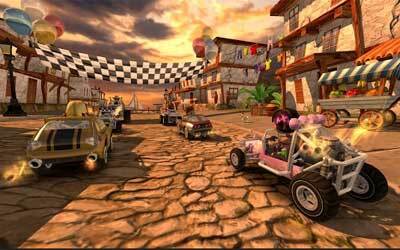 As the name suggests, Beach Buggy Racing APK 1.2.11 is categorized as racing game. The setting of this game takes place in the beach shore. Beach is commonly identical with volley ball game or surfing game. However, Vector Unit, the developer of this game uses this certain location as racing tracks. The game will allow you to enjoy the natural beauty while boosting your kart into finish line. You can try three different racing modes in this game. Besides the time trial mode, you can also race in boss versus or object collecting. Although the game is free to install, there is also in app purchases. The game control of this racing game is quite easy to master. Moreover, the animation graphic in this game offers interesting point of view. In the top screen of the game, you can see several indicators. It shows your place on the race. Usually the maximum racer in each track is six. There is also a bar indicator. It indicates your progress and your position to the finish line. Each track provides different lap that you need to complete. You can speed up your kart and use several abilities by using certain items scattered along the track. The game will automatically make your kart move forward. In order to make your kart drift on the track, you need to tap on the virtual button located in the bottom of your screen. The developer also makes the game more interactive by using tilting control. You simply tilt your Smartphone to turn your kart into a certain position. Alternatively, you can also use the virtual arrow button. This racing game uses energy system. It means you need to recharge after twenty minutes. Fully recharge will give you five points of energy that you can spend on any tracks of Beach Buggy Racing for Android.